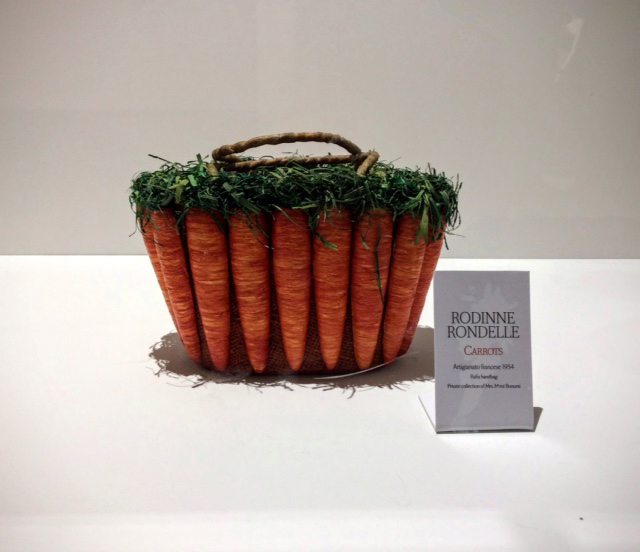 Image Courtesy of Italian Trade Commission. 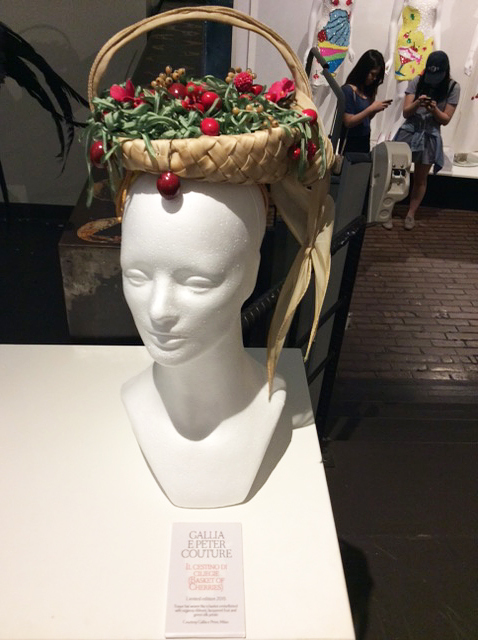 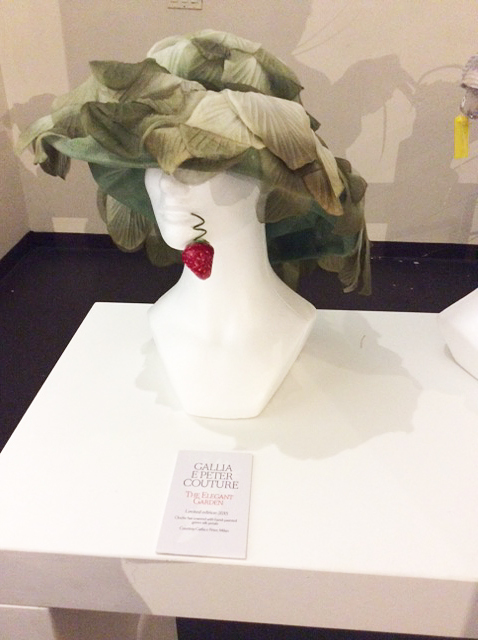 Presented by the Italian Trade Commission in collaboration with Unindustria and originally displayed in the evocative archaeological complex of the Trajan’s Market in Rome in 2015 , the exhibition L’Eleganza del Cibo explored the inextricable connection between Fashion and Food, while celebrating the Made In Italy creativity in the world. 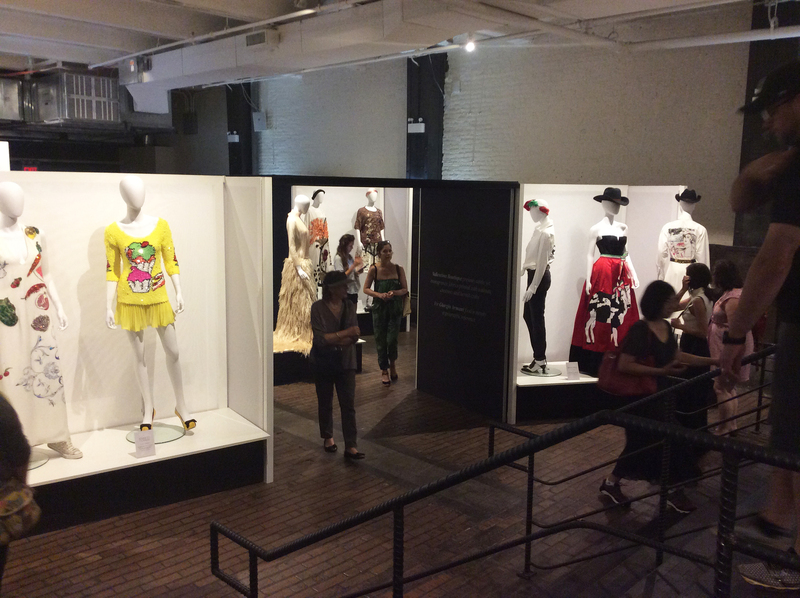 Inside the Chelsea Market – the iconic food destination for all New Yorkers – curators Stefano Dominella and Bonizza Giordani Aragno created a visual journey inspired by the contamination between fashion and food, eco-sustainability and energy. 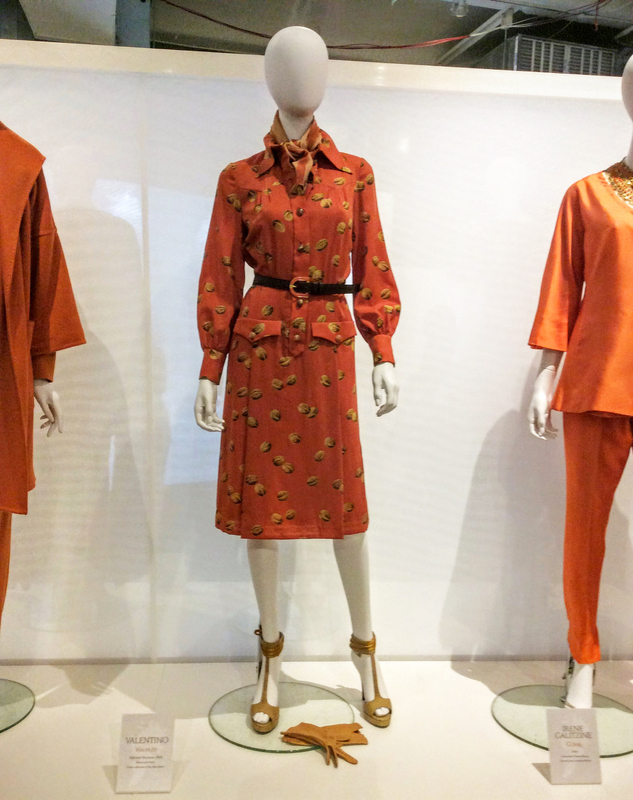 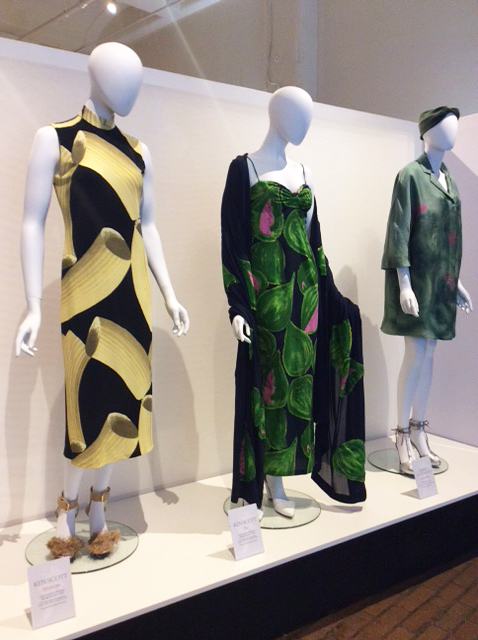 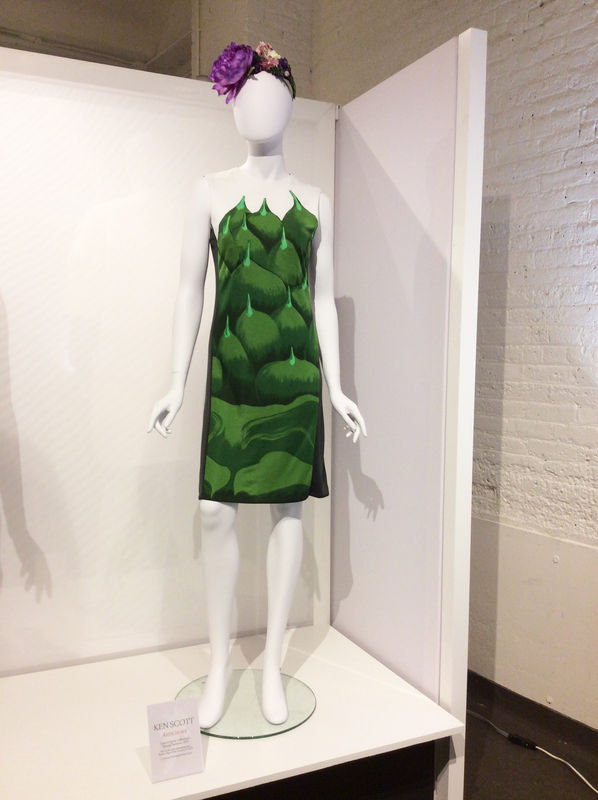 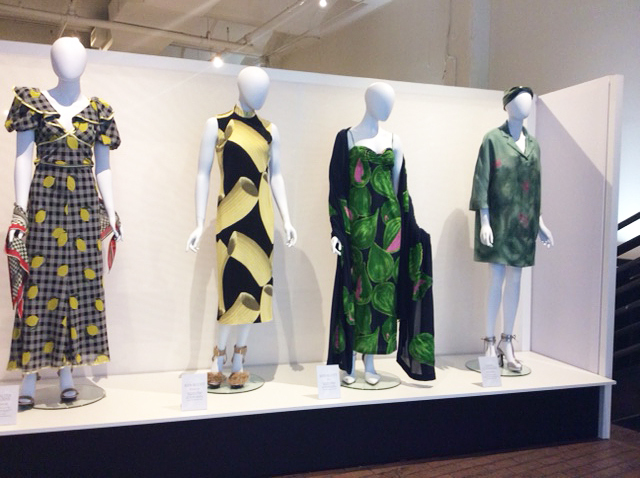 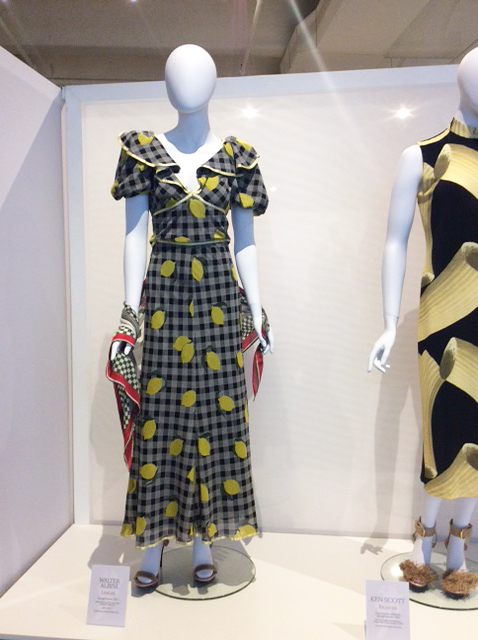 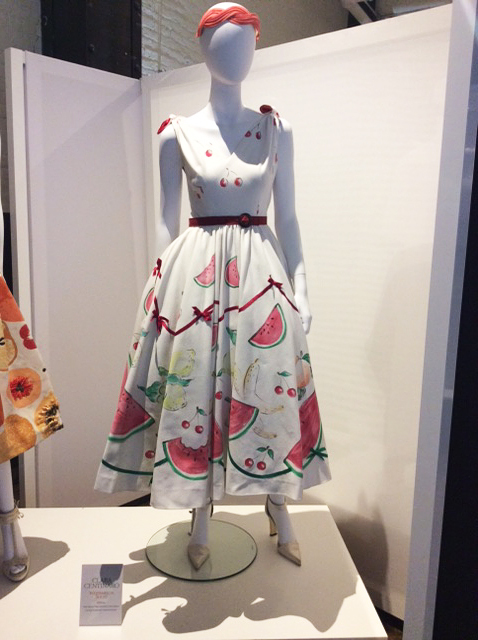 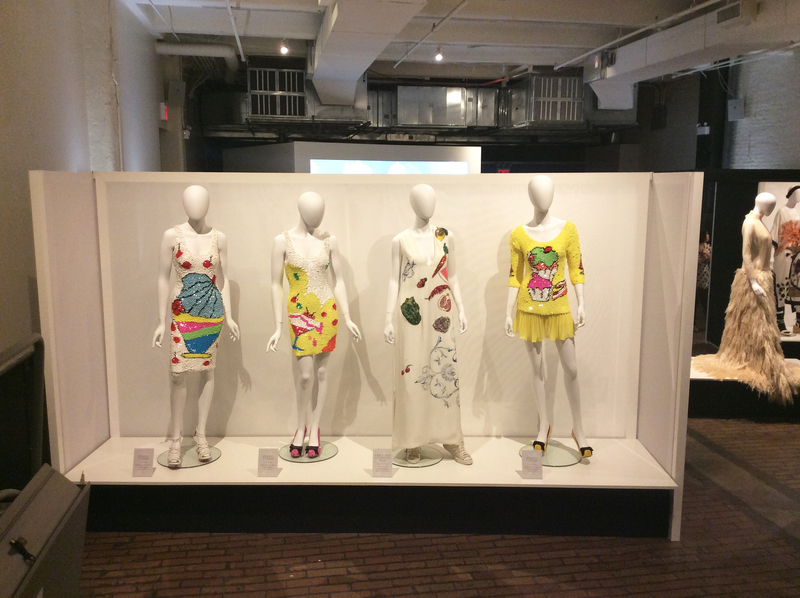 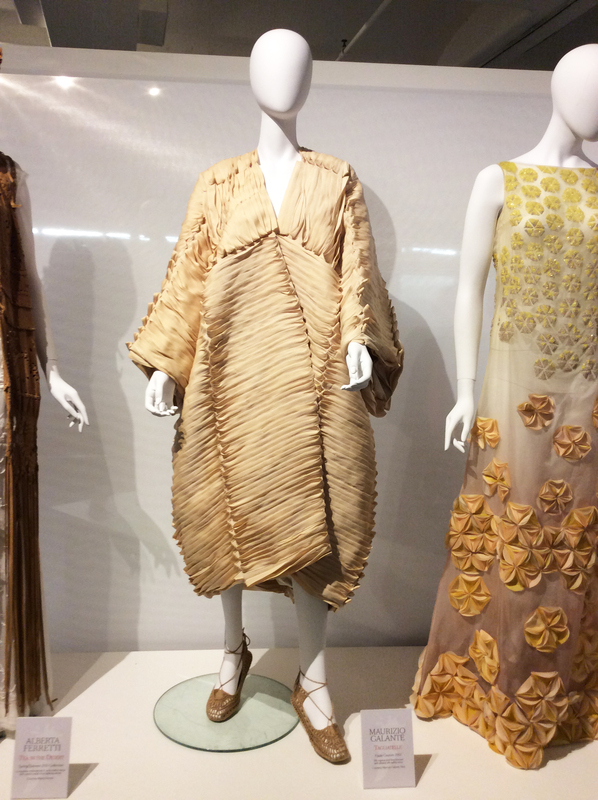 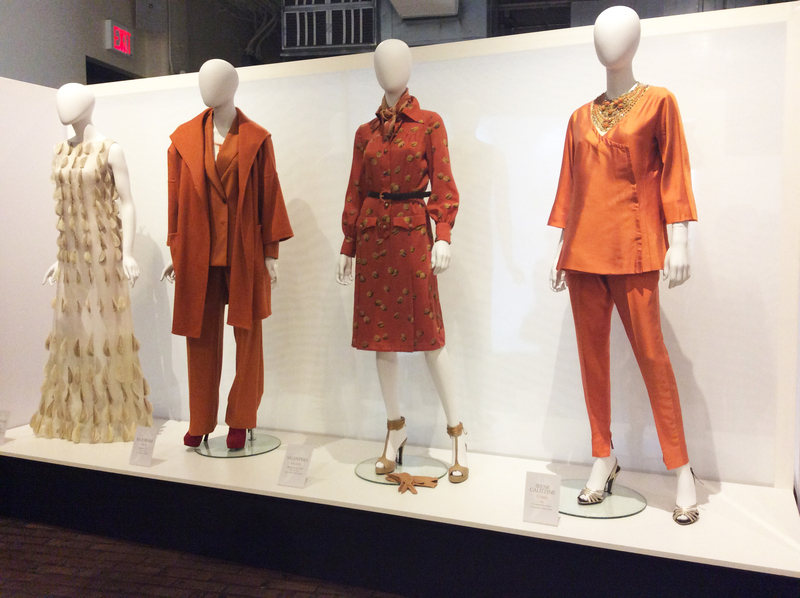 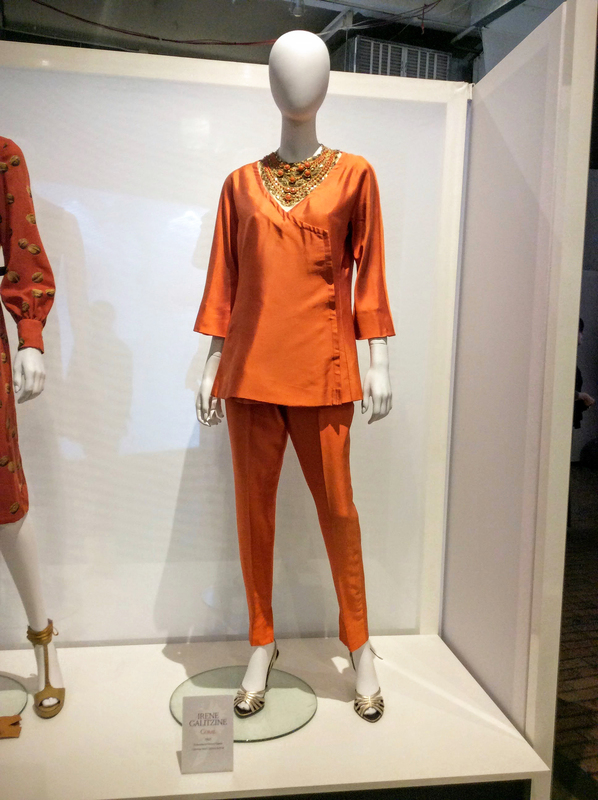 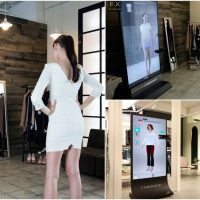 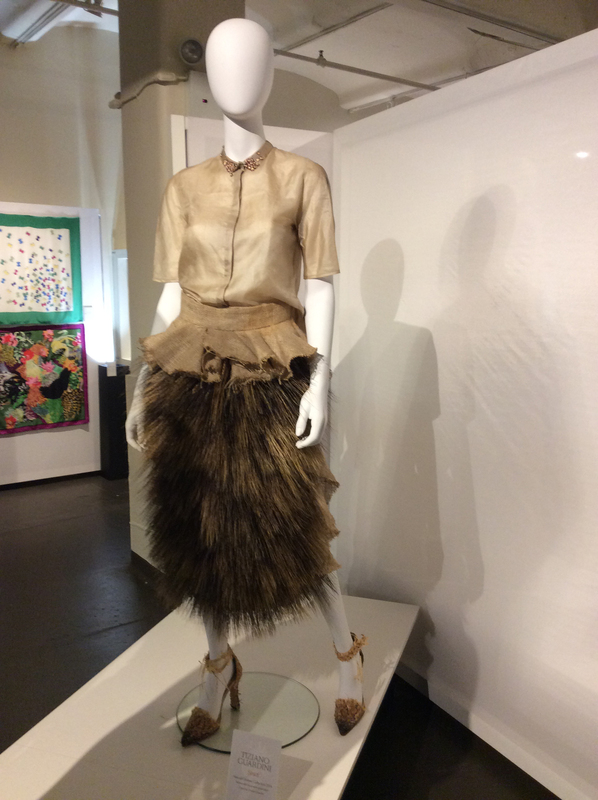 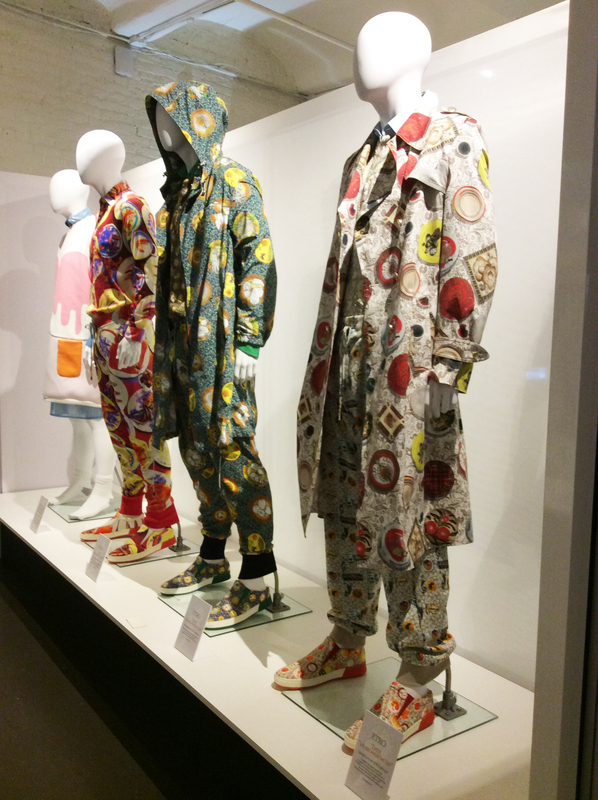 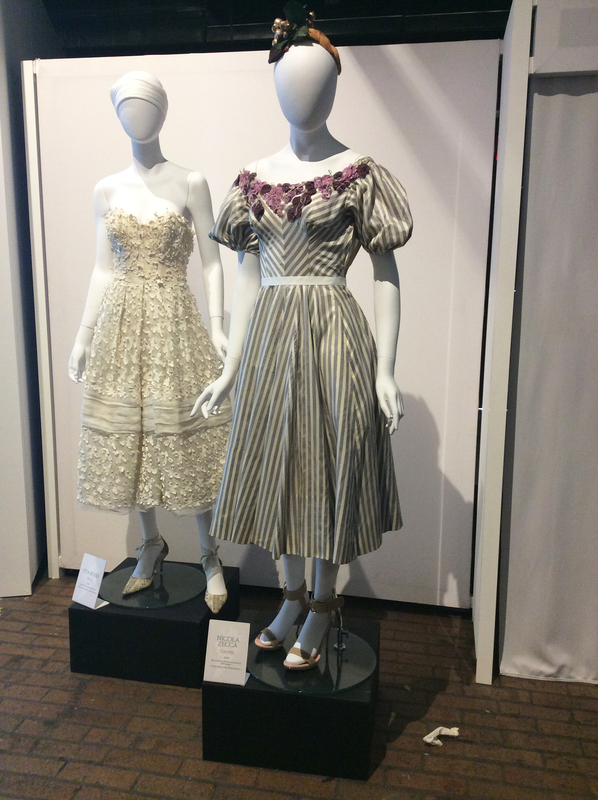 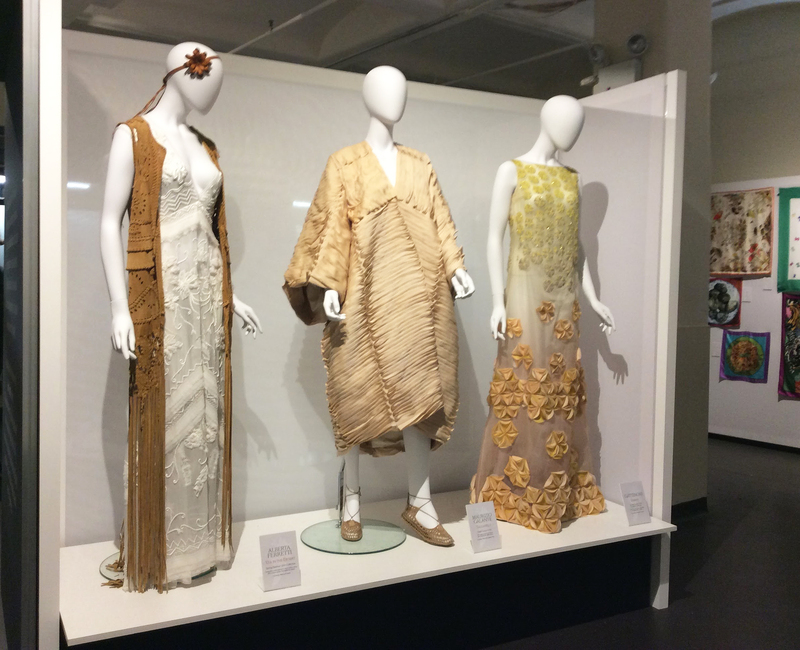 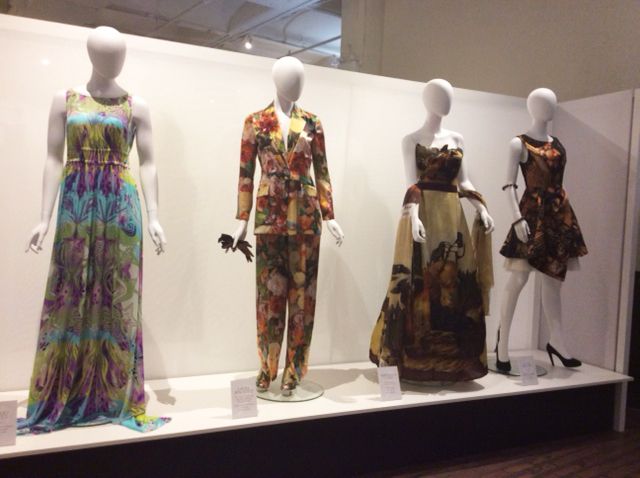 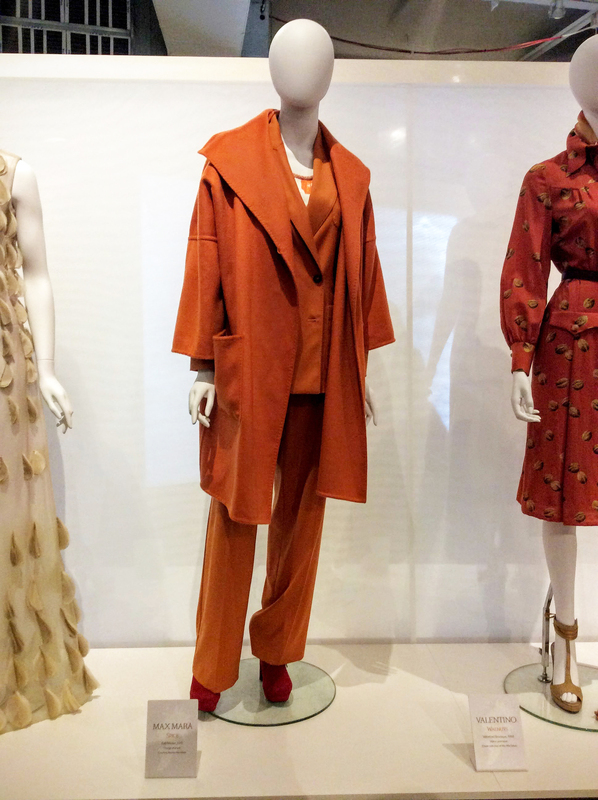 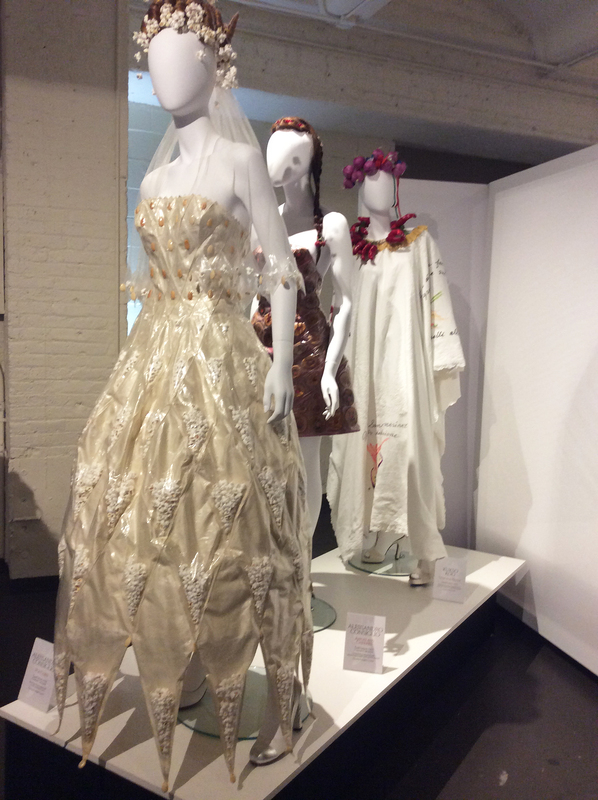 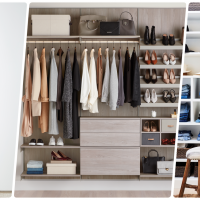 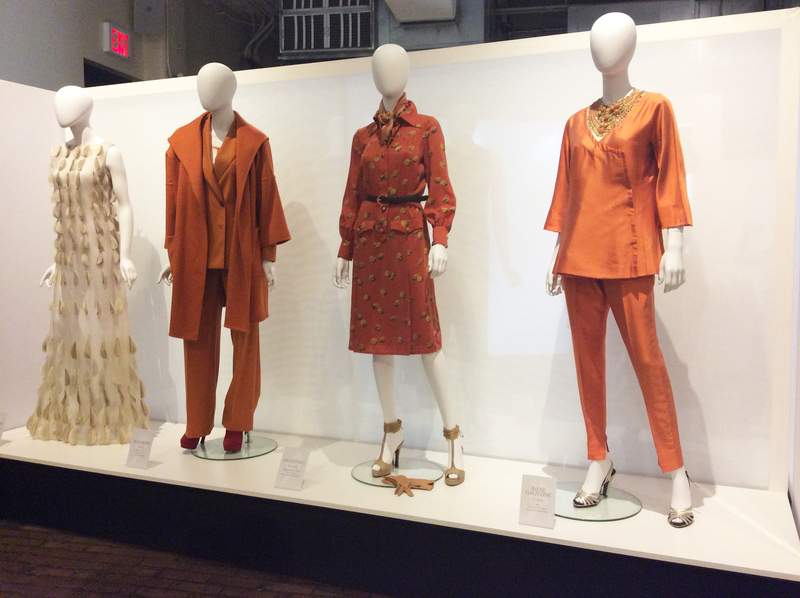 Dresses, accessories, video-mapping and visual art created a contemporary journey to showcase the mutually inspiring connection between style and nutrition throughout the last seven decades. 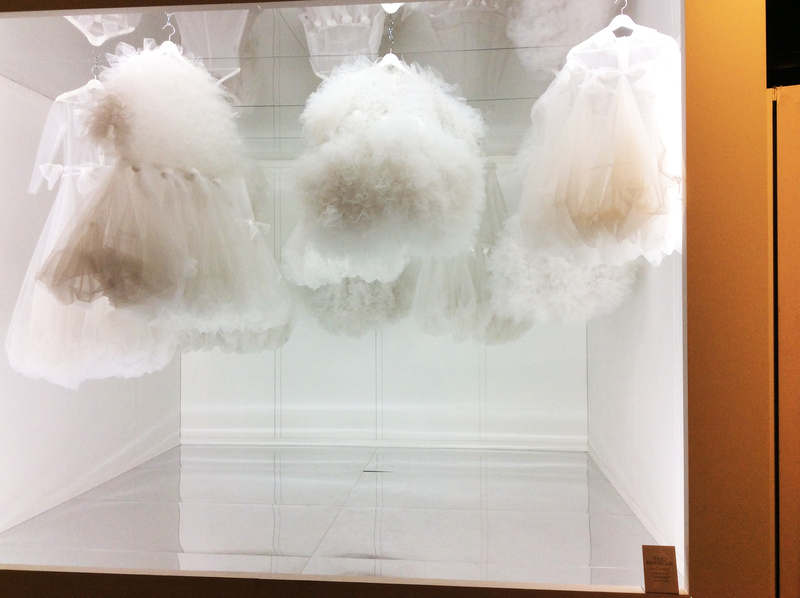 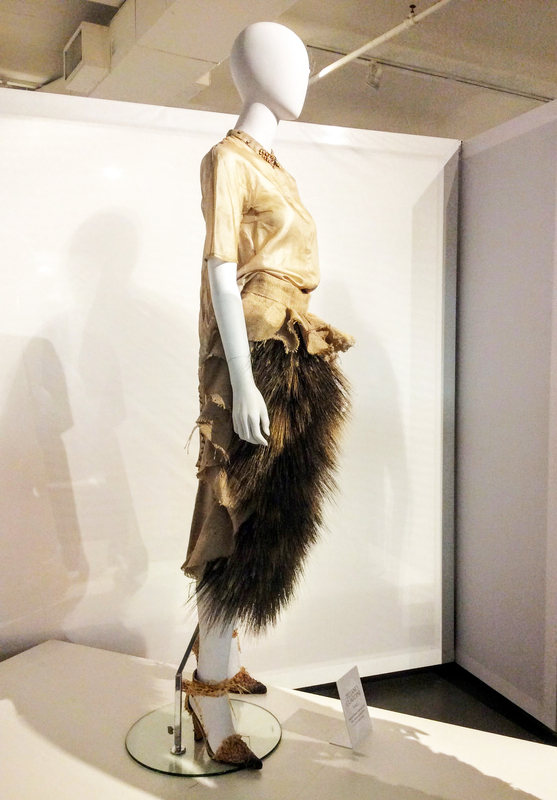 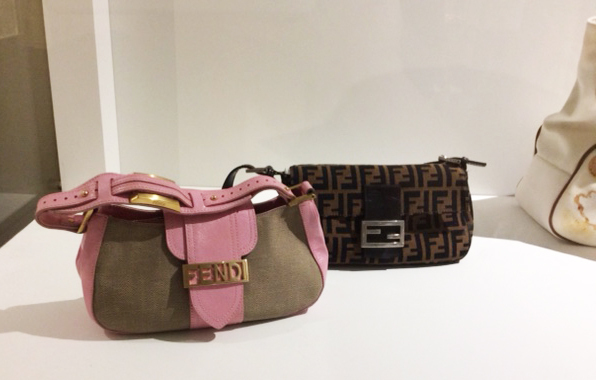 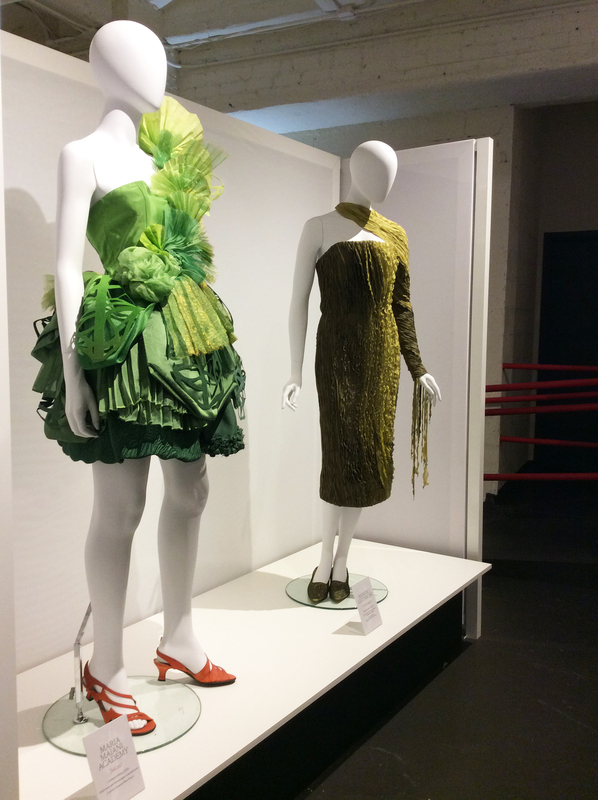 Among the 58 masterfully designed dresses and accessories, original creations by Giorgio Armani, Etro, Valentino, Gucci, Gattinoni, Salvatore Ferragamo, Moschino and Laura Biagiotti were on display at the exhibition. 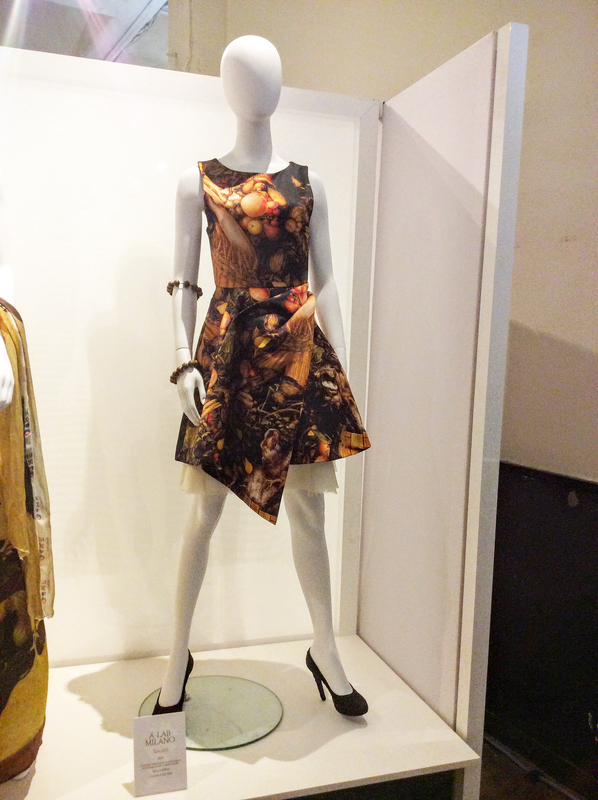 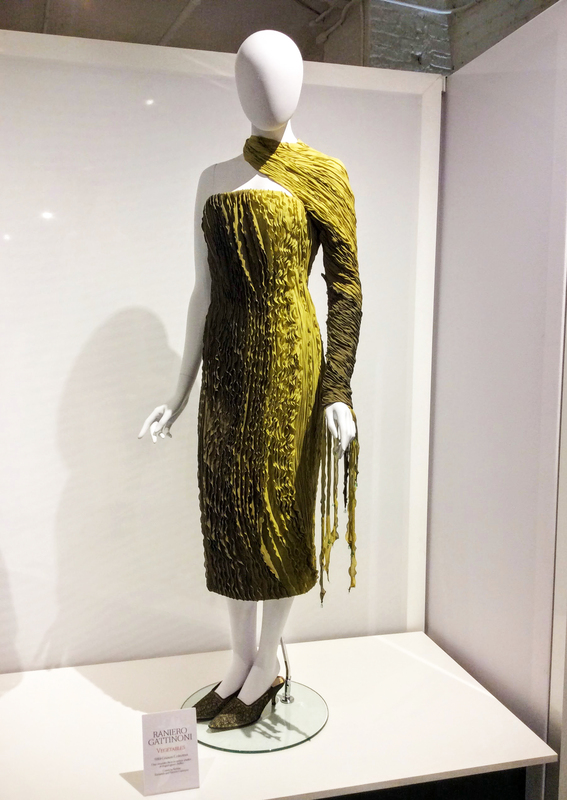 Giorgio Armani’s dress from his Prive’ Collection, Image Courtesy of Italian Trade Commission. 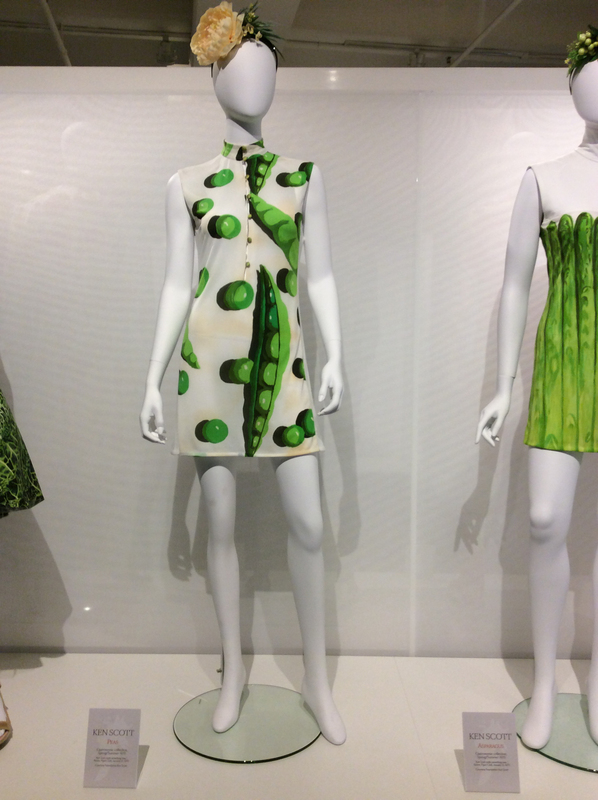 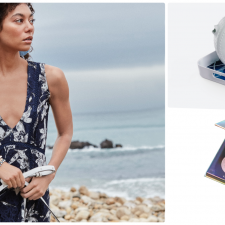 While Giorgio Armani’s dress from his Prive’ collection is inspired by the delicate yet strong eco-sustainable bamboo plant, Etro interpretes the slogan “We are what we eat” by creating digitally designed images of strikingly colorful Italian banquets abounding in shellfish and pasta. 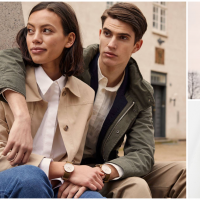 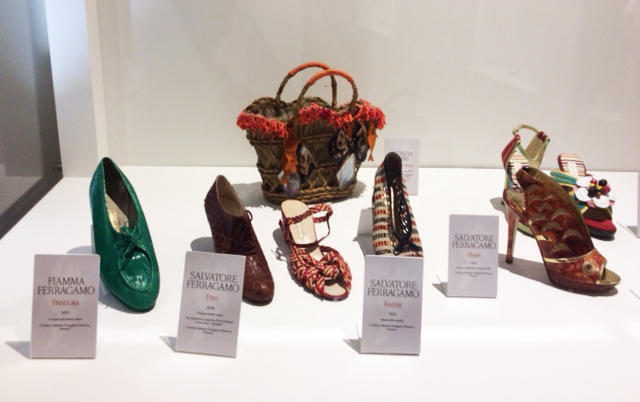 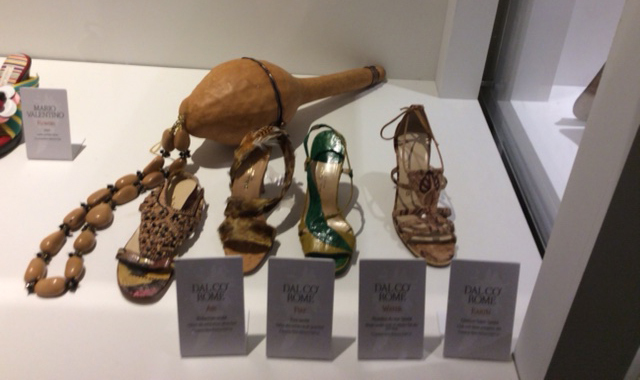 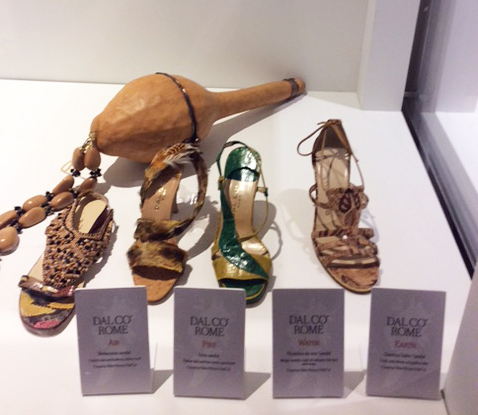 Always keen to use “poor materials” such as cork, raffia and hemp, Salvatore Ferragamo showcases some of his most iconic footwear coming from the historical archives of the brand’s Foundation. 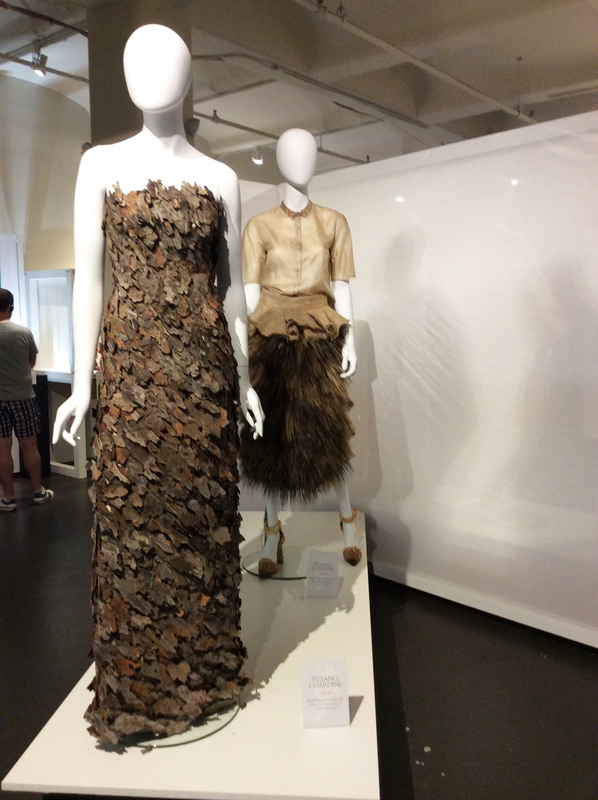 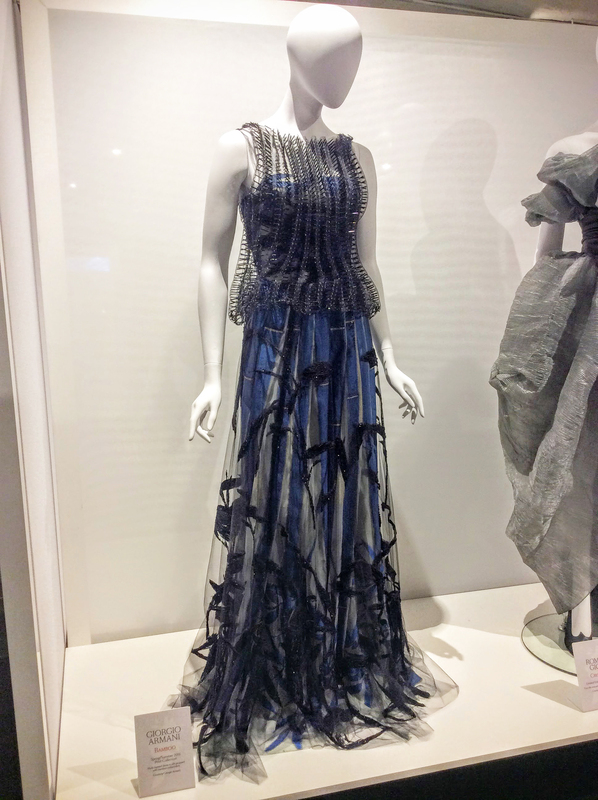 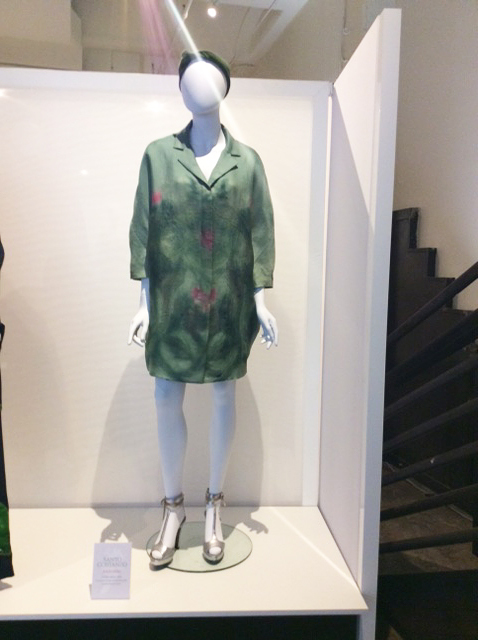 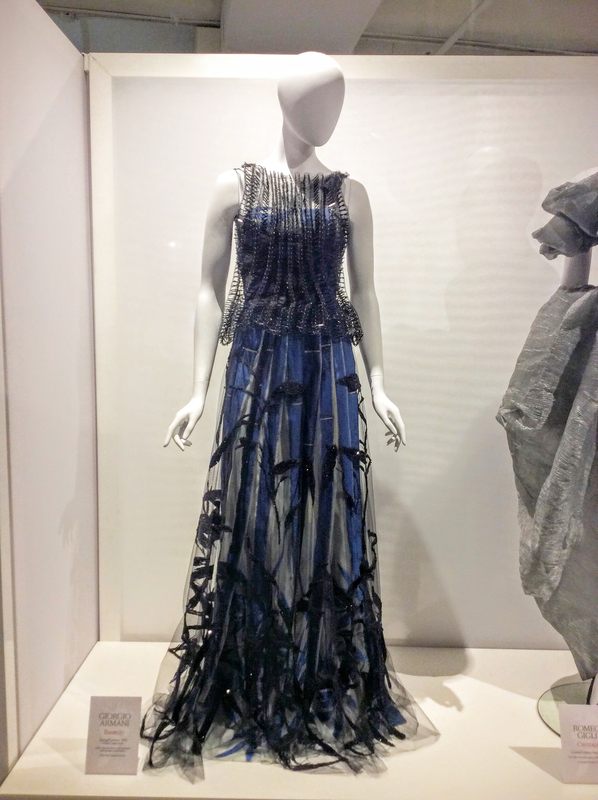 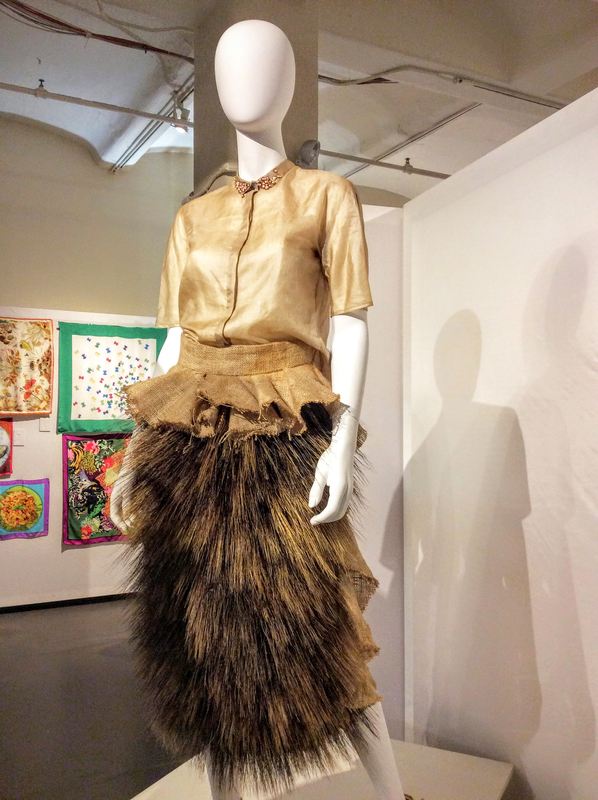 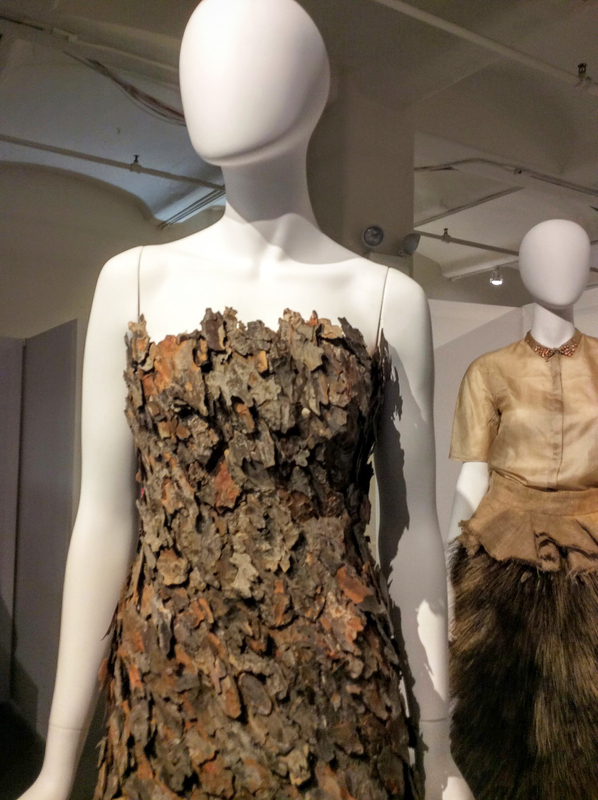 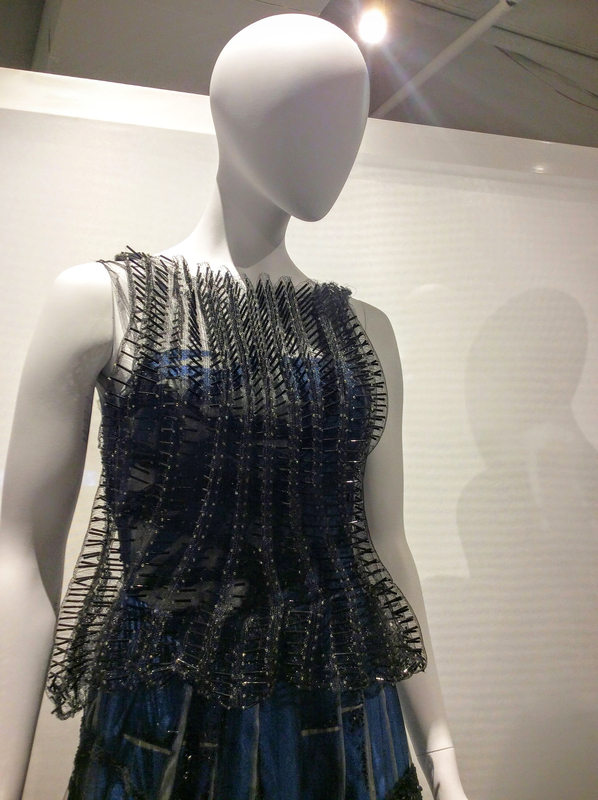 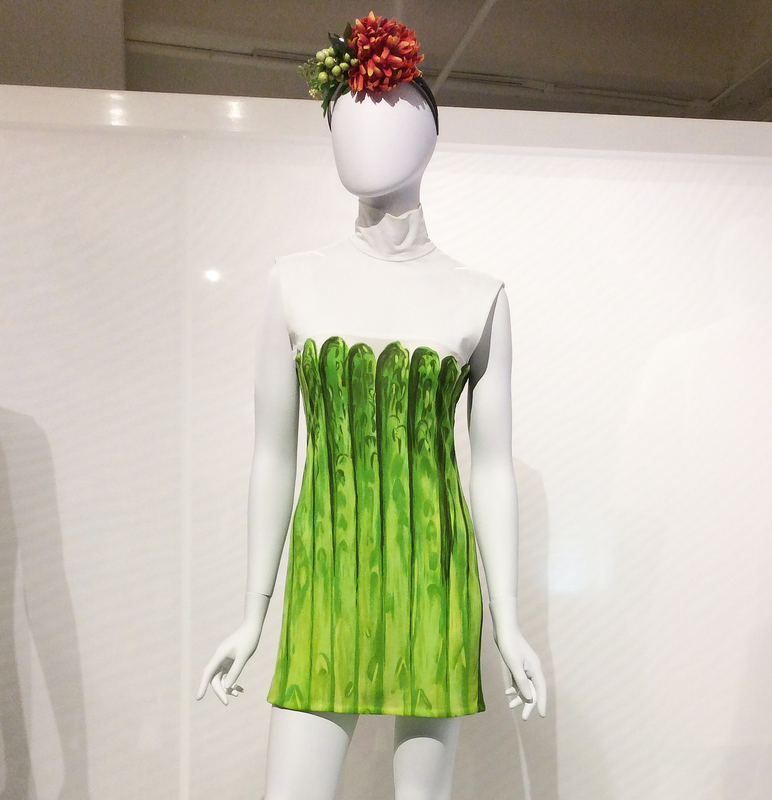 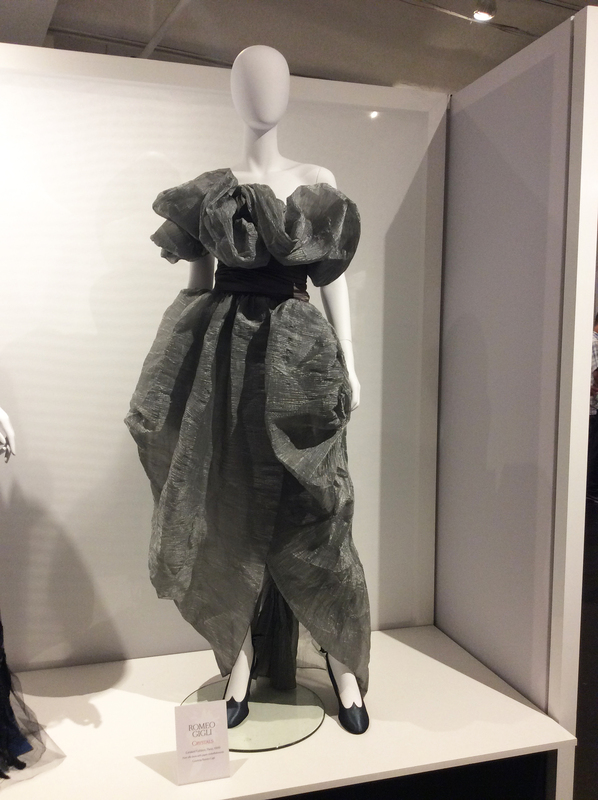 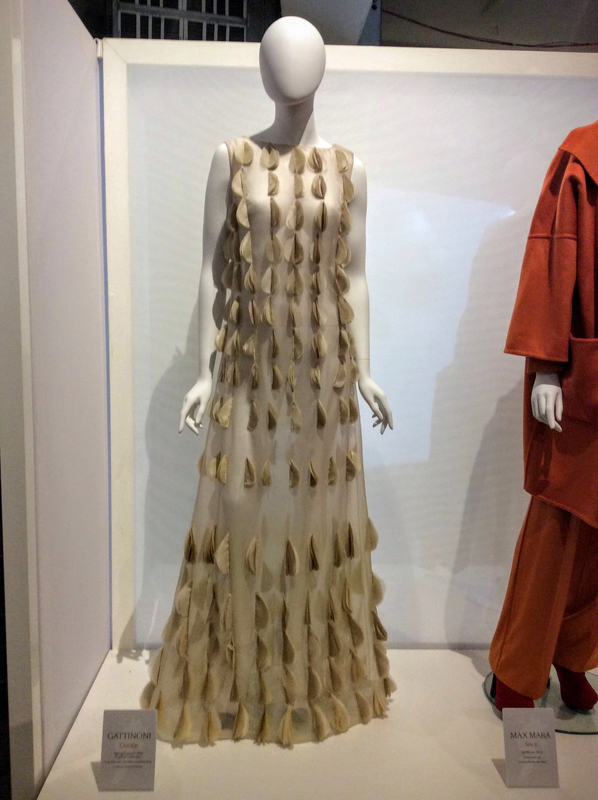 Adding up to the complexity of the exhibition, the “Designer of Nature” Tiziano Guardini chooses licorice roots for his eco-friendly “natural couture” dress. 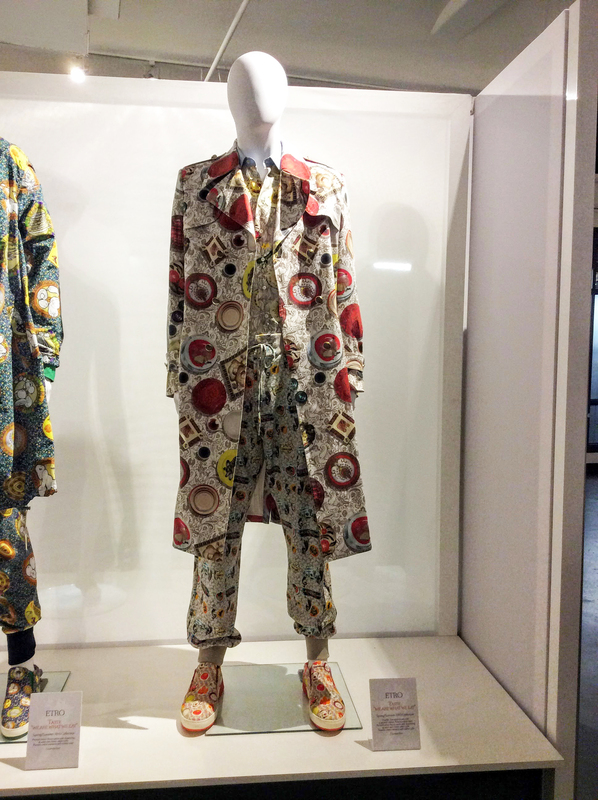 Gattinoni’s “Bread Suit”, Image Courtesy of Italian Trade Commission. 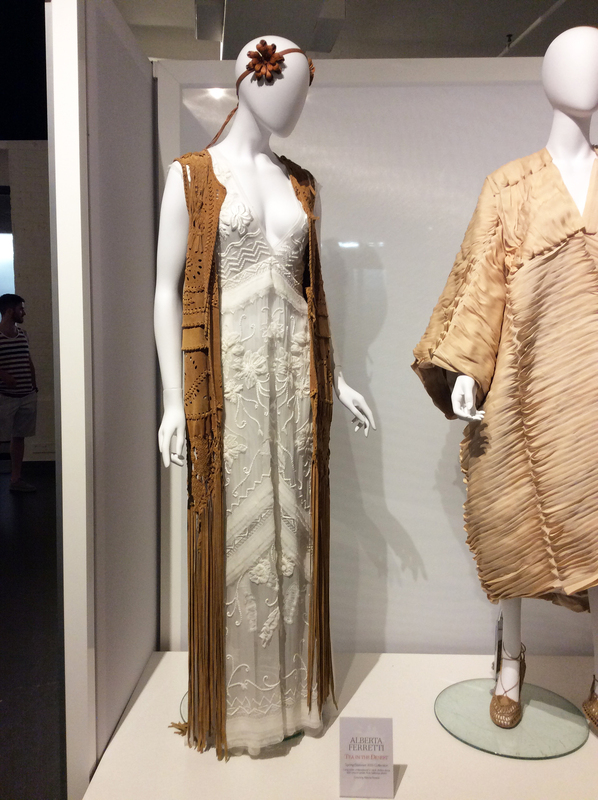 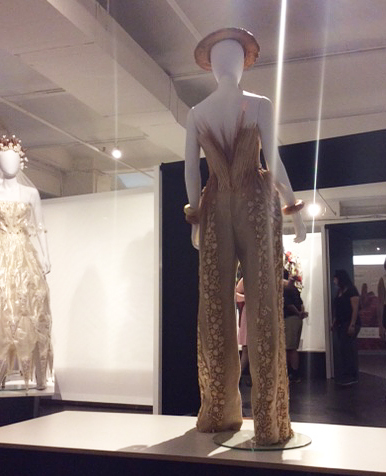 Gattinoni’s “Bread Suit” uses wheat sheaves for its bustier and jute embroidered with glazed salted biscuits for the pants. 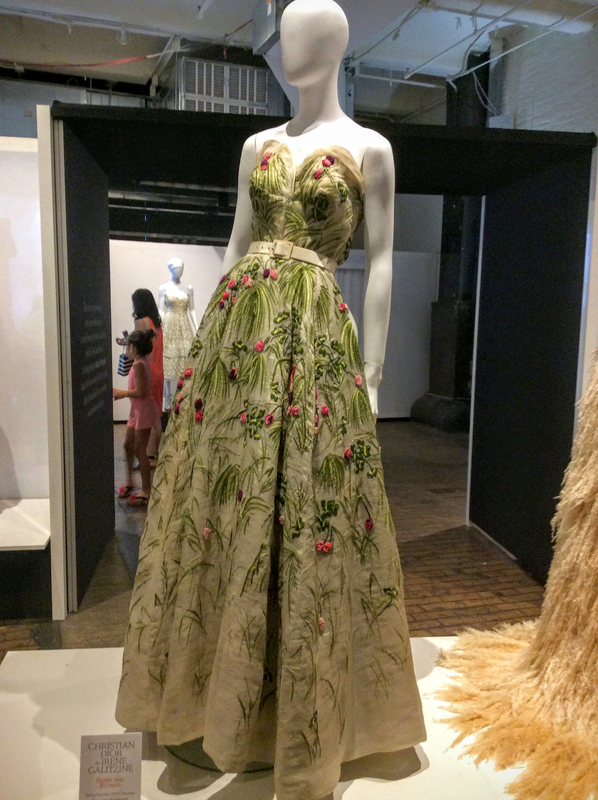 Ken Scott, the “Gardener of Fashion” who was known to splash nature on his creations, completes the visual itinerary of the exhibition. 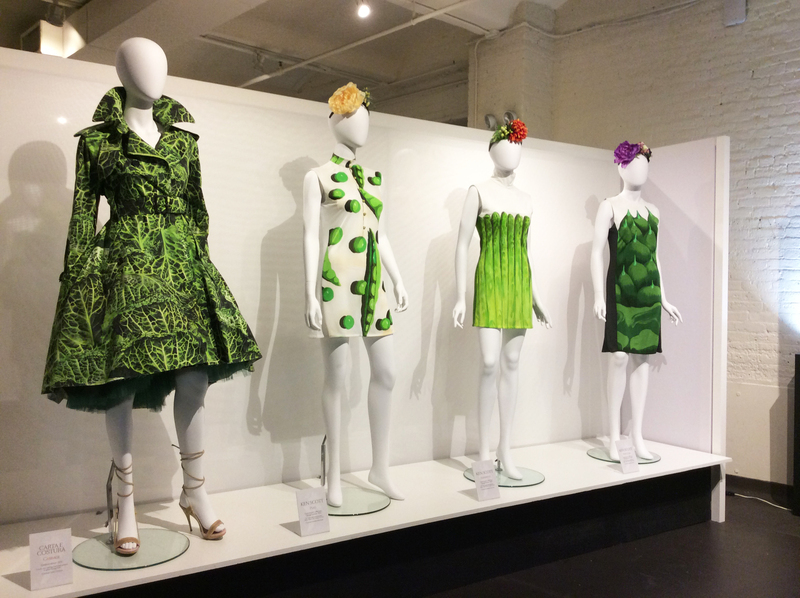 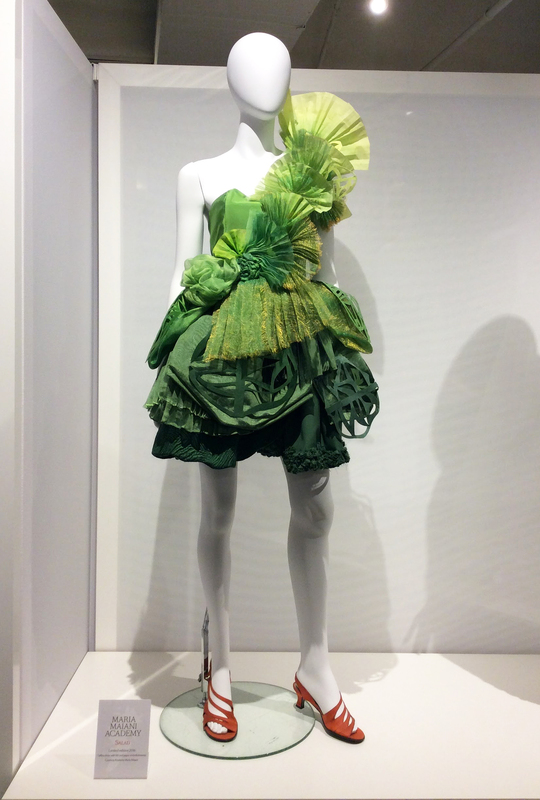 His colorful prints of asparagus, peas, artichokes, and apples become a wearable “vegetable garden”. 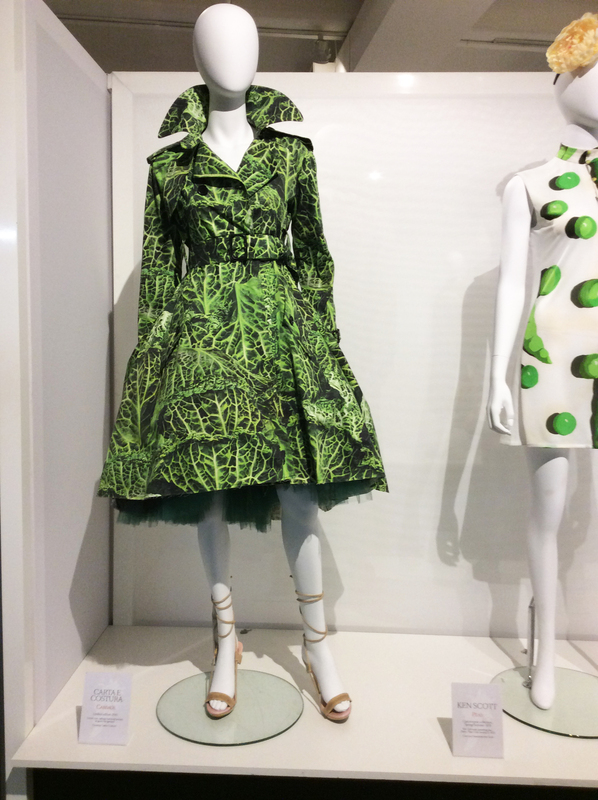 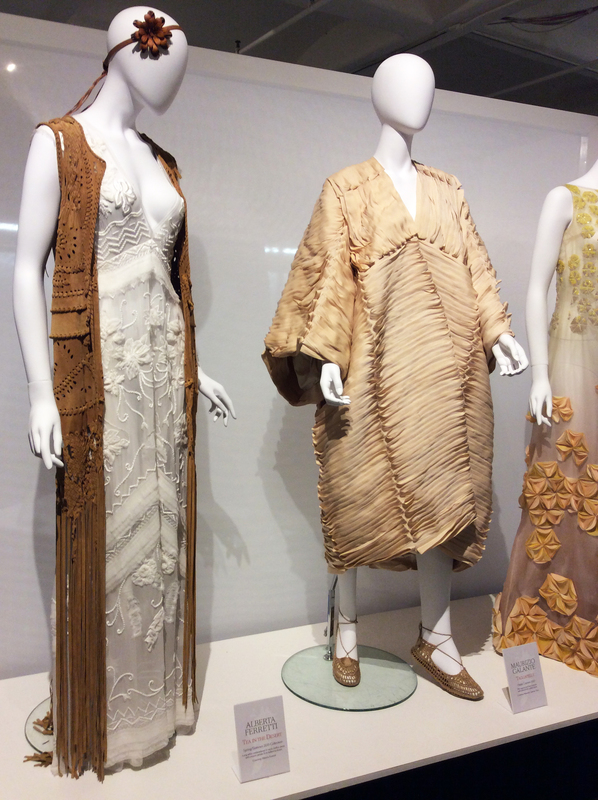 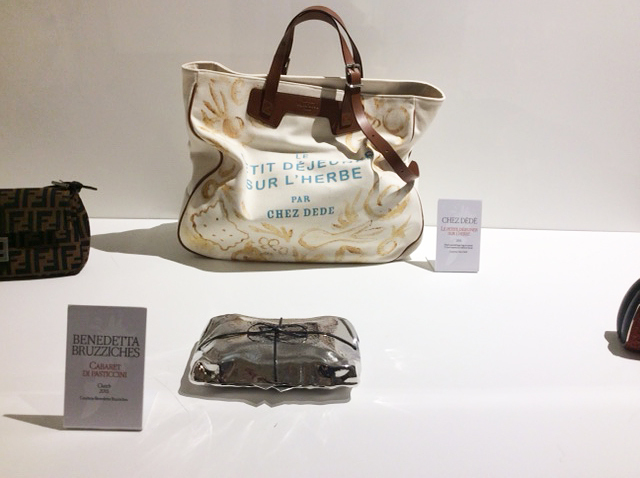 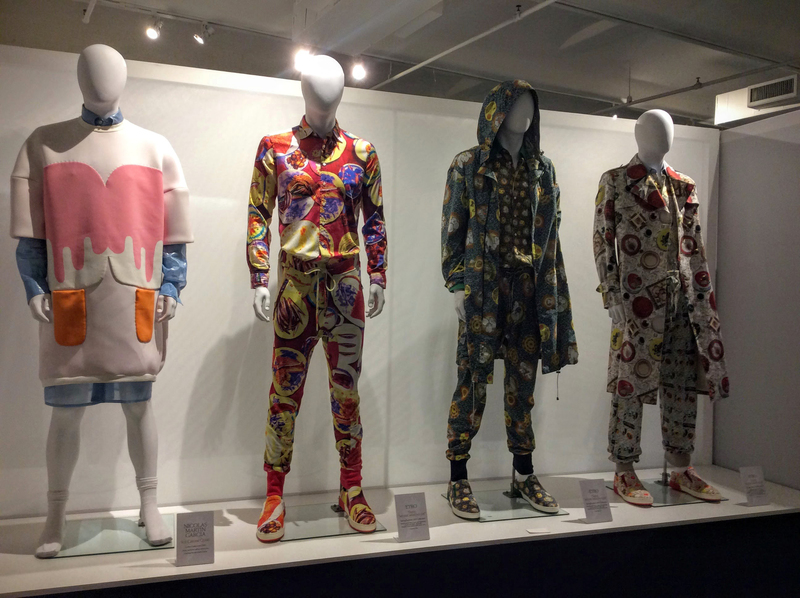 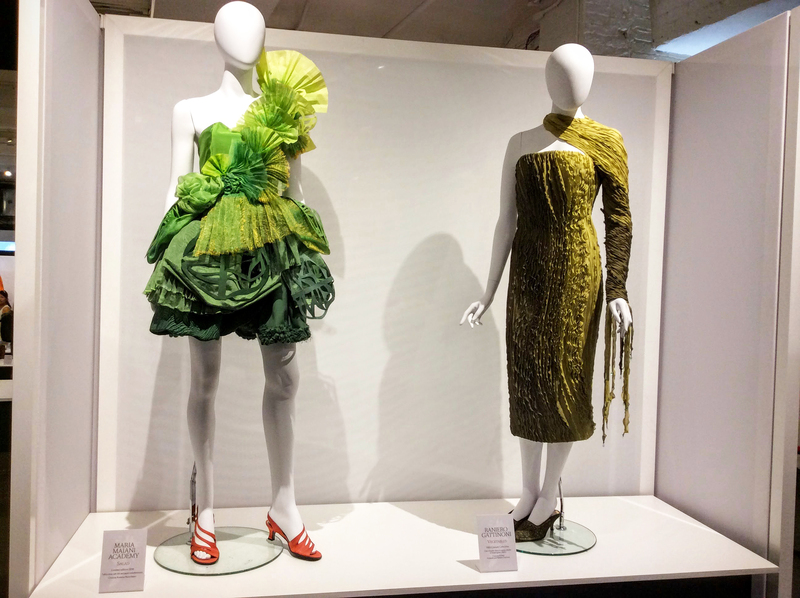 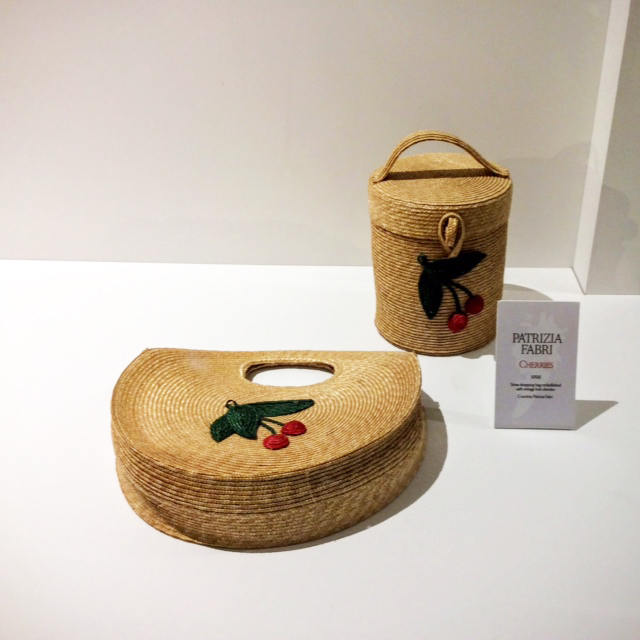 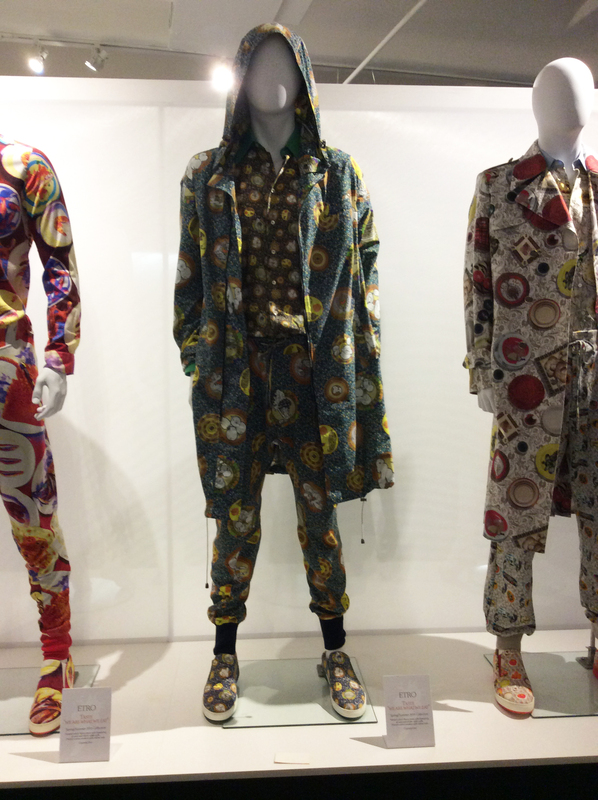 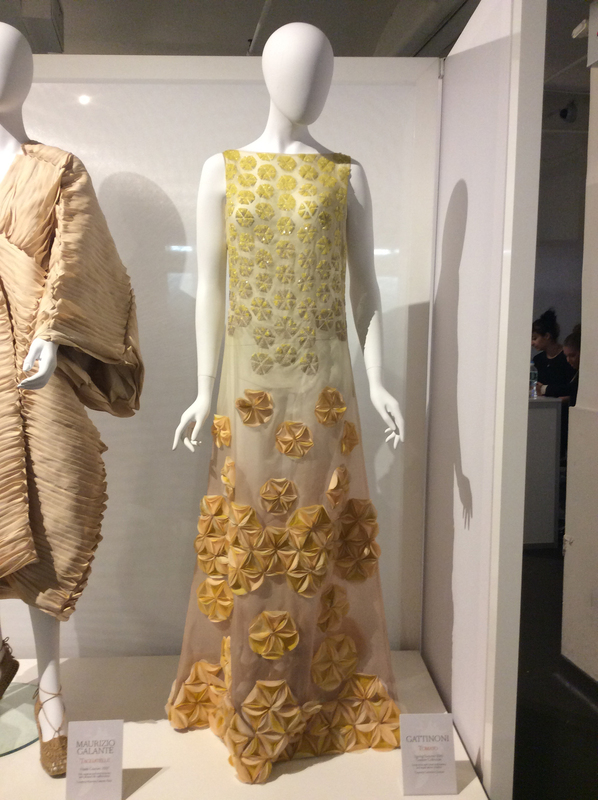 “I’ve always been intrigued by the relationship between Food and Fashion”, said Stefano Dominella, curator of the exhibit and CEO of Gattinoni. 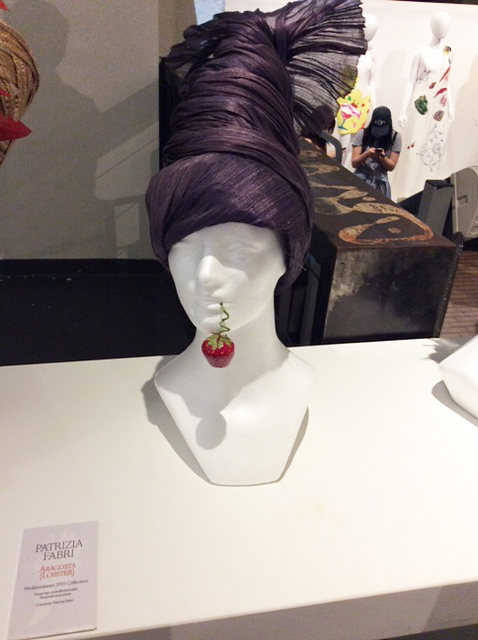 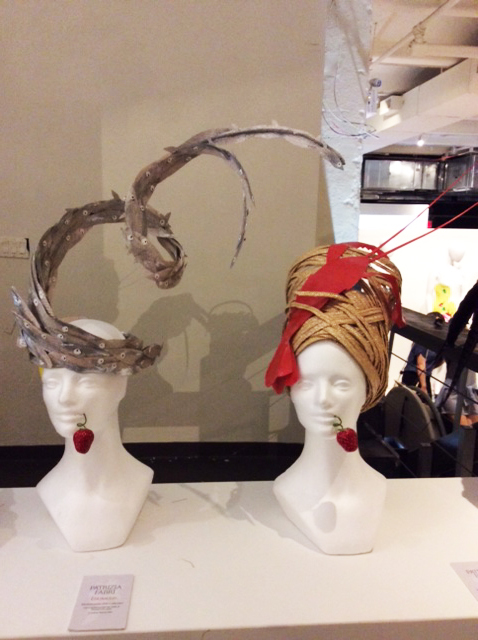 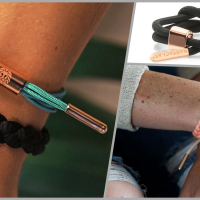 “On one hand food nurtures the body, on the other, fashion stimulates the imagination and self-expression. 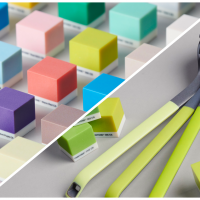 But food also satisfies our taste and appetite often inducing a “culinary anxiety”. 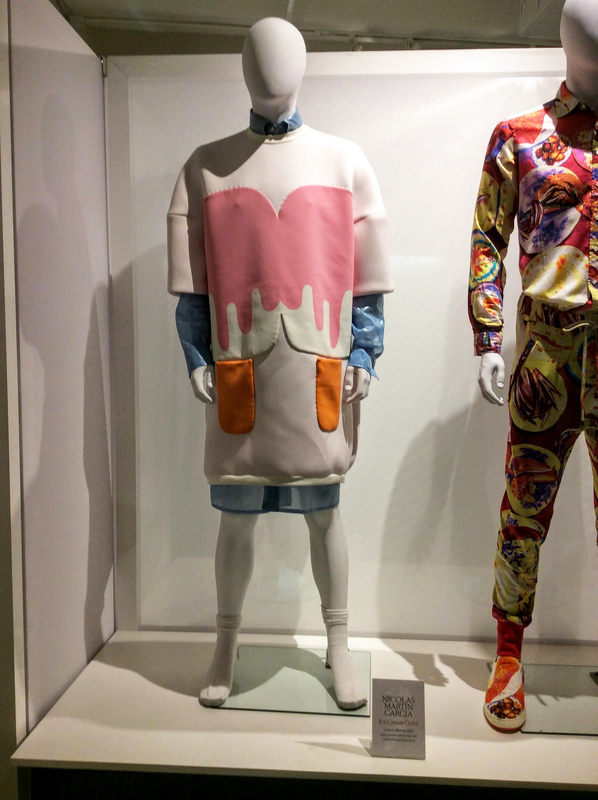 Throughout the years Fashion has incorporated all these layers into its creative irony. 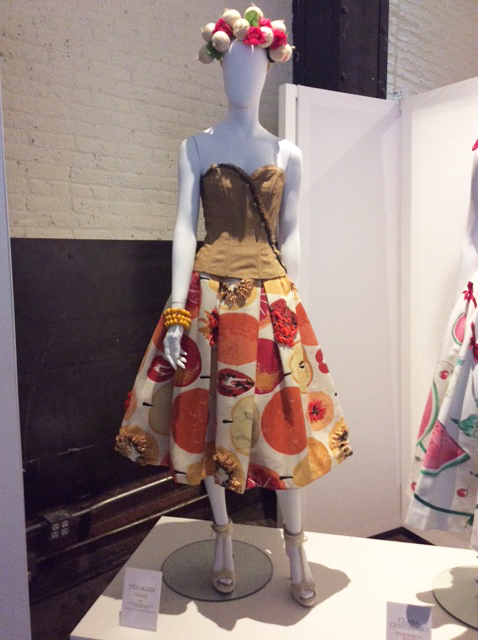 It’s from the mood of this “Culinary Dolce Vita” that I conceived the idea to combine Fashion and Food, both to smile at this “odd couple” as well as to deepen the many nuances connected to them, including their ties to nature and the environment”. 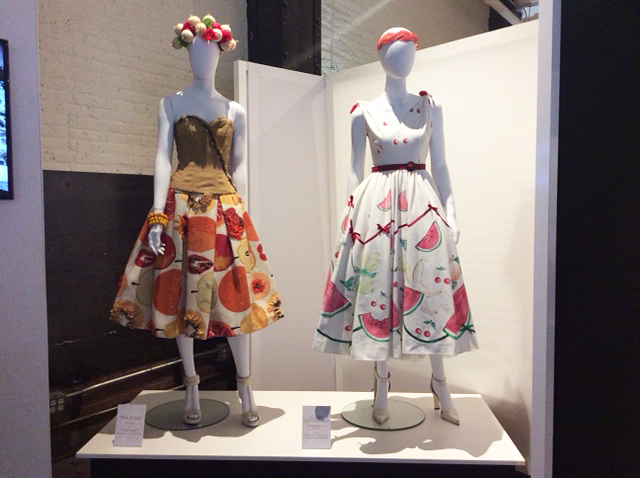 “L’Eleganza del Cibo”, adds Italian Trade Commissioner Maurizio Forte, “is part of the Special Plan that the Italian government has launched to promote and import our fashion and food in the United States. 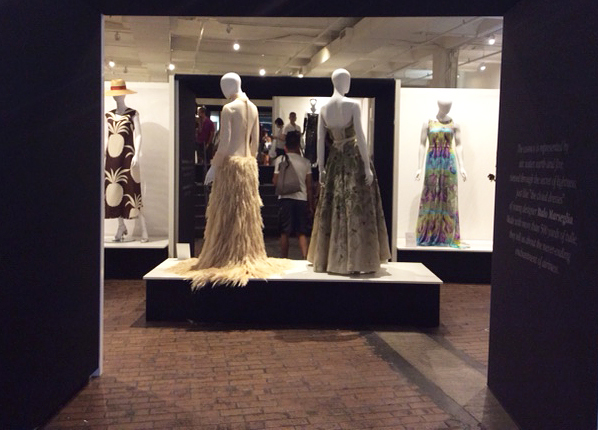 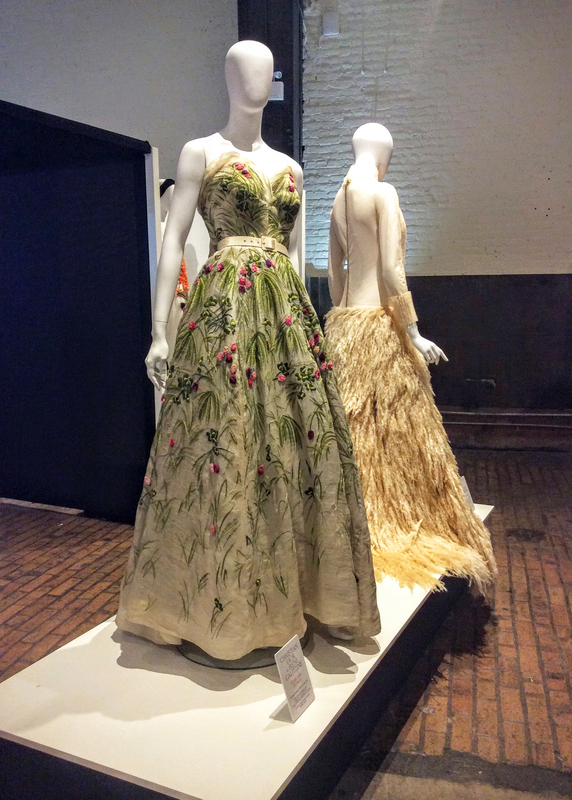 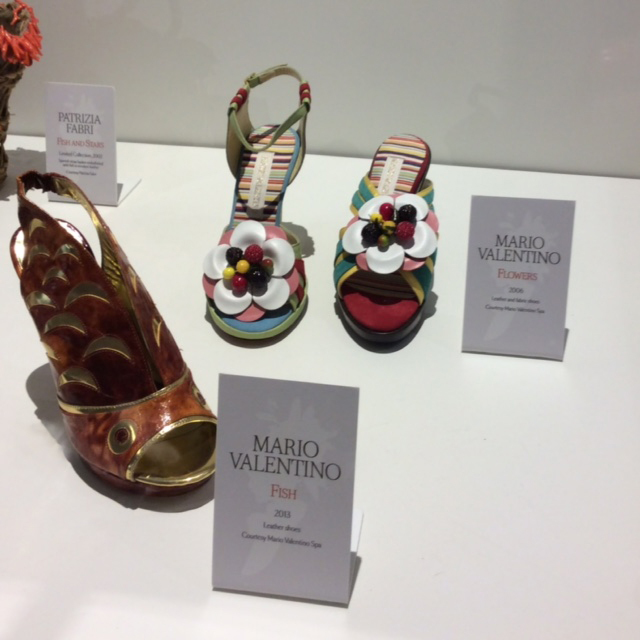 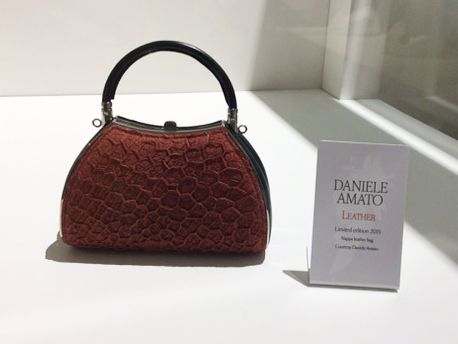 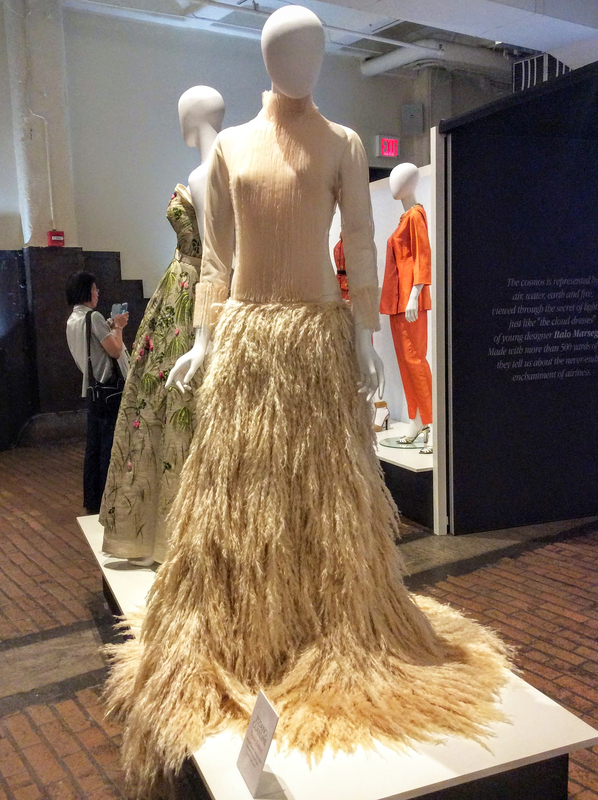 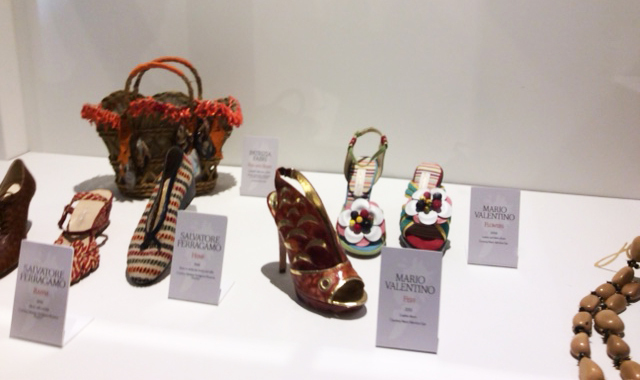 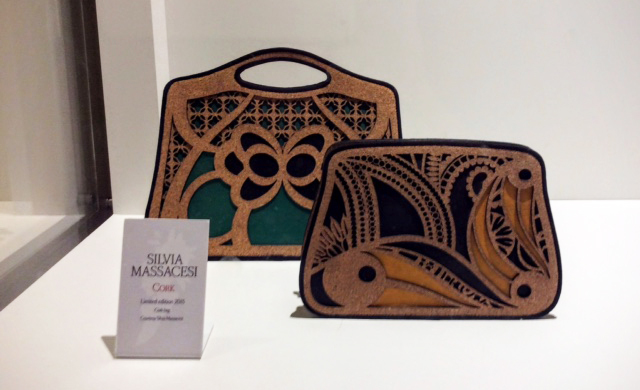 This exhibit offers a great opportunity to present, for the first time in the U.S, the fascinating liaison between two key assets of our Extraordinary Italian Style”. 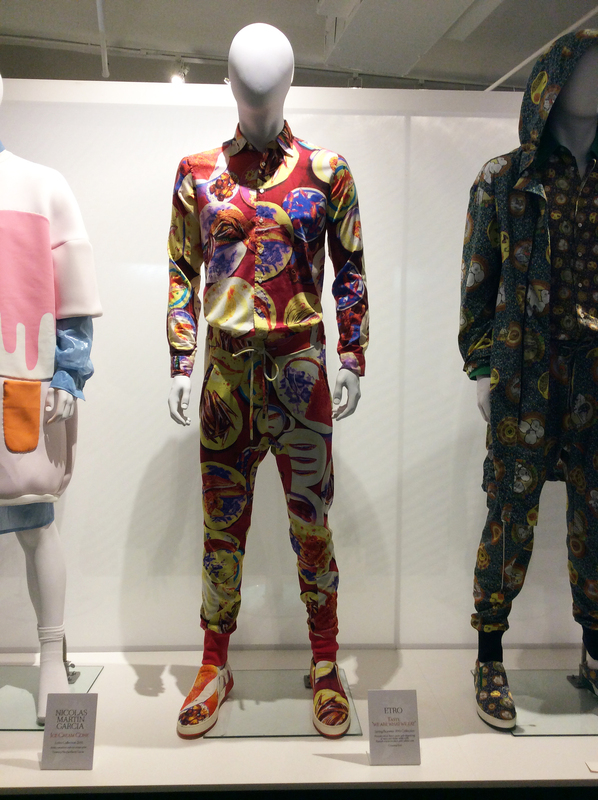 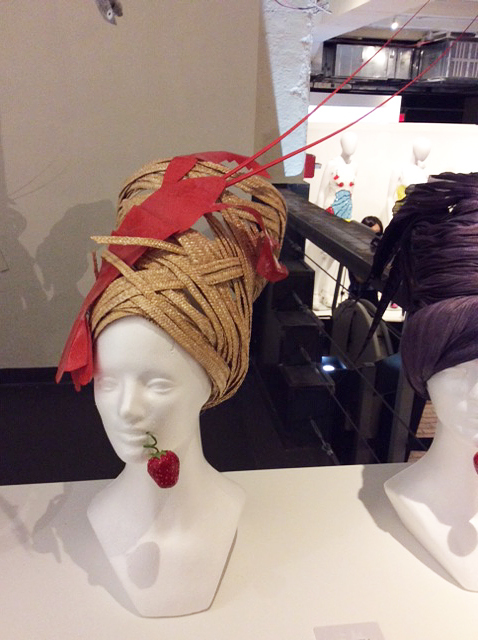 All exhibition photos by Nilufer Satorius © Fashion Trendsetter.